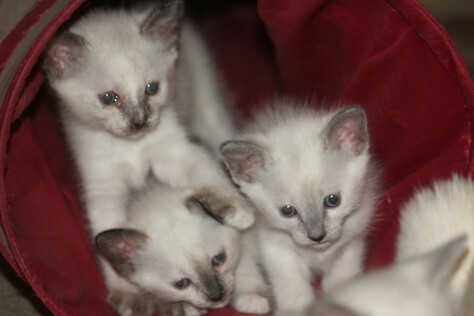 We specialize in Flame Point or Red Point Traditional Siamese. We do get blues and seals also. Suki's next litter will have a take home date in Aug 2019. Reserve now with deposit of 200.00. Secure your kitten with a deposit NOW ! !Our kittens sell before they are born. Choice goes by date of deposit. they are TCA registered, traditional color point. Reserve now with deposit, or contact us to get on the waiting list!! Secure your kitten with a deposit NOW !! You can reserve your kitten with a 200.00 deposit. They will have their first set of shots, worming and vet check. They will already be litter trained, eating solid food, and have been raised around two nutty dogs. You can trust that you are getting a socially well adjusted and cared for kitten, from a loving home, from a home breeder of over 10 years. We are not a kitten mill, these kittens have been part of our family from birth. 1 year Health guarantee is included. Prices are 450.00 and up depending on the colors available.